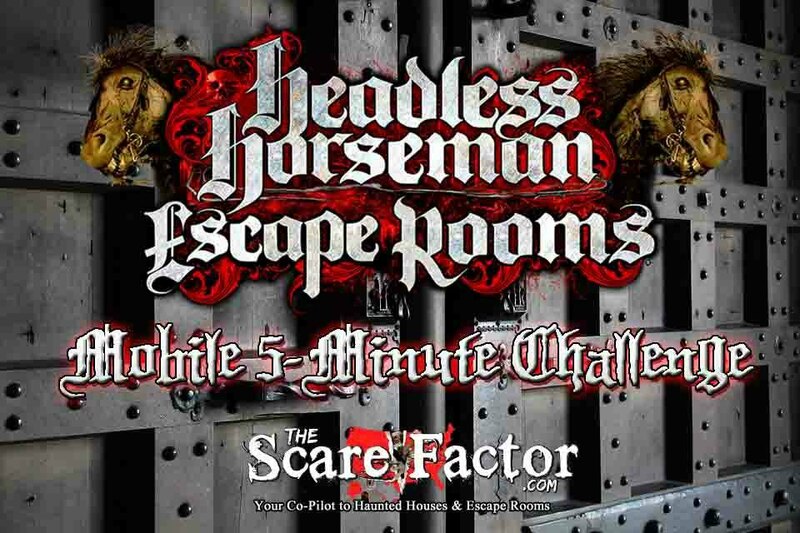 As if 65 plus creepy acres of wooded farmland, 10 Haunted Attractions, and 3 full escape rooms wasn’t enough, now Headless Horseman Escape Rooms offers two mobile Escape Games. For just $5 per person your group of 4 or 5 people can attempt to beat the clock and solve Bio Hazard and Missile Command in 5 minutes or less. These are Hi Tech games and each feature different types of challenges. They share a mobile trailer and could actually be combined for a longer game where you would move on from one room to the next after completing that challenge. The trailer is currently nestled between the last two haunted houses you encounter on their property, in the back by their Haunted Village area. I say challenges rather than puzzles because these games involve completing actions rather than trying to solve something, so I think of them as more of challenges. This type of ER is along the lines of the next step for escape games with mobility allowing HH ER to bring these games to the customer for team building, parties, and local fairs and such. These also feature shorter games of 5 minutes for faster turnover and increased capacity. Unlike the full size HH ER’s that are permanent on the grounds of the Headless Horseman Hayrides which are designed for and best played in a larger group, these small mobile escape games are ideal for small groups down to even 2 or 3 people. In fact, given the space inside and the required challenges, it probably would be best with no more than 3 people. Both games feature an Alien/ Sci Fi theme that incorporates the tech aspects of the game, with Bio Hazard being more of a medical/ science lab setup that involves manipulation of objects primarily. There are 2 or 3 challenges in this room that are completely hands on, with a quick search component that I felt wasn’t necessary given the difficulty level of the game. With just five minutes and the only instruction being initially to find a hidden object, it takes a few seconds or so to adjust to the environment and what you need to do. Our group started out strong finding the object and progressing on to the first challenge after unlocking what we needed next. From there it went downhill as we did not realize what was the solution for the first challenge, or puzzle in this case. Once we ran out of time, the rest of the room was explained to us, as we only got about 33% of the way done and it didn’t seem like it would be possible to complete all 3 steps in 5 minutes, or least it would have been very difficult for most in my opinion. We then moved on to Missile Command, which was definitely my favorite among the two. Here, you are presented with a large control board that takes up one end of the room and some sort of device on the wall with glowing lights and some other electrical items. The control board has a number of parts that control different items on your list to be powered up or deactivated. This is accomplished by inputting the code on the back of the checklist you find on the control board. On the front of the checklist is the list of system names you have to go through to prevent the missile launch or to launch a missile in defense (I’m not sure which; it went by fast and it doesn’t really matter). There’s no trickery here, just find the system on the board, match the order to the proper switches shown – but not labeled – on the back of the sheet and do it as fast as possible. There are monitors above the control board showing the missile in the silo or being launched, but I was mostly focused on the large timer on one of them. So my team did much better here having specific instructions and, again, it was really a two-person situation with the third person, again, adding input, but not necessarily needed. We were almost to the end when the countdown started, lights flashed, smoke filled the room, noises got louder and we came up just short. What we found out afterwards was that a task early on that we thought we had completed was not actually done correctly, but this was confusing as it seemed the lights that signal “successful power up” came on, but it was just a regular series of lights and not what we were suppose to see. This was the only drawback to the room as it was hard to tell that we did not complete it. The rest of the room was fun, fast paced and awesome. With only 5 minutes, you can’t have a regular ER puzzle where you have to think about something and then solve it, it needs to be action or reaction and the checklist helps that process. No trickery needed just see how fast we can get it done and, if we fail, you could literally try again to see if you could go faster. We were also able to get started faster in this room, as it was clearer what we were supposed to do right away and not lose precious time. In general, I though these games were cool and I like the Hi-Tech and Special FX aspects to them, but still feel like an 8- or 10-minute game would be better… not only for the experience, but for your dollar value as well. Although, at only $5 per room, it’s still pretty reasonable for a quick bit of entertainment.